It rained for an entire year when I lived in Holland. Men dressed in long coats and black hats slipped wearily in and out of the corner cafes but the weather only partially explains the somber mood of the Dutch people. Karen’s story is one that I can’t forget. It is a story with an unending stream of missing facts , surfacing with the slightest association, always leading back to the eternal question of whether the will to live is inherent in all living things . 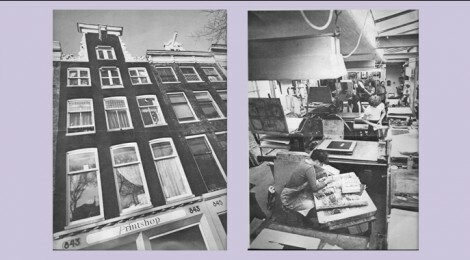 The Printshop was located on one of the major canals surrounding the city of Amsterdam. Artists with a diverse range of talents moved in and out of the shop all day, sitting with Piet at the coffee table planning out the next stage of the print process. I was a printer from America, an objective onlooker, the foreign worker, immune to the supposition of greatness that the public had bestowed on certain artists who visited the workshop. Every day, I watched the scenes unfolding in the shop as if were watching a movie from the balcony with the sound turned off. I did my best to learn the language but after two years in Holland I remained the consummate outsider. I noticed Karen for the first time when she came in to the workshop to visit her friend Bettie. Bettie was a stern looking, uptight printmaker who went into a rage if I attempted to speak with her while she was busy working, wiping the ink off her etching plate. It was true that the printer needed to devote the utmost attention to her task but for some of us the job was an effortless, joyous celebration and not the frustrating work of an underpaid victim of the Dutch working class. Karen was unremarkable, a regular looking girl who could get lost in a crowd, but she was a free spirit, outgoing, atypical of the Dutch personality. She was more of a foreigner here than I and perhaps that’s what drew us together. She entrusted me with the task of making her art and the resulting print is all that remains. For all I know it could have been the only print she ever made. The next time we met she had quietly made her way into the silk screen area and stood behind me as I gently pressed my thumb into the fibers of the screen to test its tautness. “I wish you would touch me like that”, she said shyly. Her statement caught me off guard but I smiled and continued working on the screen. “Do you think it’s wrong to marry someone so they can become legal citizens of the country?” She continued to speak but I withheld my reply allowing her the chance to unburden her restless soul. She challenged me with her need for self-expression, sharing the most intimate details of her life. I remained attentive while she confessed to other questionable acts, accepting my role as one who was at the service of the creative mind whatever form it happened to take. Days later, I had just finished printing an edition of prints when Karen came bursting into the shop holding a radio in the air that was blasting out the iconic show tune “Copacabana”. She was singing, “her name was Lola; she was a showgirl” moving as if she were part of a chorus line, waving a colorful scarf around her neck and flicking it with her hand. I got caught up in the sudden burst of excitement and began singing and clapping along while she danced around the shop. We each reveled in the diversion from our daily tasks, I, from the repetitive task of pulling the squeegee across the silkscreen several hundred times a day and she from the vultures on the street who took advantage of her naïveté and her need to be loved. The Printshop was a premier workshop that offered the tools, techniques and personal guidance that artists needed to achieve their printmaking goals. Karen saw in this place a supportive atmosphere, a place where eccentricity flourished, a place that she longed to be a part of. It is not known how the idea for her print came to her. New ways of thinking about art can be derived from many sources. Simple objects placed within a novel framework can create new associations with profound implications. When Karen walked into the shop that day she was holding up a book of matches. She made a slow, dramatic entrance while holding the colorful matchbook in her right hand close to her face. I became fixated on her unusual pose. It must have been a delicate moment for this fragile woman to muster up the courage when she declared her commitment to the artistic process. She moved closer, holding on to the matchbook, honing in on the object, examining her new source of inspiration. “I want you to make a print of this for me”, she said. She carefully opened the flap of the matchbook as if she were opening the velvet case of a diamond ring. Inside the cover the paper matches with their round red heads appeared as a crowd of people standing blank faced in a row. 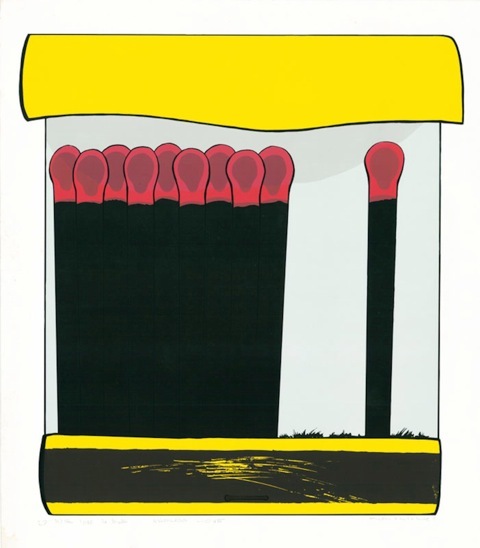 Next to the rows of matches were ragged empty spaces where the matches had been torn away from the surface. On the opposite side of the pack stood one solitary matchstick. I nodded in approval as the meaning of the print came into focus. It was the perfect metaphor for Karen’s world as I perceived it. As other printers in the shop had predicted, Karen was unable to fund the project. After conferring with Piet about the cost to produce an edition of silkscreens she left the shop until weeks later when she suddenly showed up demanding that I take a ride with her to visit her uncle. Our positions as printers in the shop gave us a great deal of freedom and responsibility. Piet had the ability to control and nurture a workshop filled with independent thinkers, allowing each of us to develop our talent to its fullest potential. Having Piet’s best interest in mind, I decided to go with Karen. I stopped what I was doing and left the shop with her walking along the narrow brick sidewalks and over several canal bridges that connected the city. We got into her car and drove south into the countryside. During the ride Karen talked incessantly. The topics shifted back and forth between her famous uncle, the new silkscreen we were going to make and her upcoming marriage to the Moroccan man whom she met at the Dam Square selling cubes of hashish. We drove by immense sections of rich marshland bordered by miles of irrigation canals and herds of sheep grazing near the roadside. We passed the orderly lanes of Van Gogh’s Poplar trees and the majestic windmills painted by Van Ruisdael. A place of total serenity, the land so flat that as it winds into the horizon you are assured that its change of direction will lead you to your destiny. Karen’s uncle was an architect of some renown who lived in a community of modest, one story brick homes. When he greeted us at the front door I sensed a cautious tone in his voice but after Karen introduced me as a printer from the Printshop he became more at ease and familiar in his speech. I could only imagine the kind of relationship that had developed between them , all the drama and subplots of the family dynamic was beyond my sphere of understanding but I knew that the success of our visit could prove to be a turning point for Karen , her chance for redemption. I began an impassioned presentation, the purpose of our visit and the specific stages of the print process. Her uncle was skeptical from the start and I surmised that this wasn’t the first time she had asked him for a favor but after sitting for several minutes in his parlor he agreed to fund the project. The ride back was eerily quiet . Karen’s mood had changed from exuberant to solemn . We both remained silent as we sped through farm country passing cars along the two lane road when Karen suddenly pulled off to the side and stopped the car. She sat with her hands still clutching the wheel, her eyes fixed on an object in the distance. I followed her line of sight into the marsh and saw that a fat ewe overburdened by its woolen hide had fallen onto its back and was struggling to get up. I turned to Karen and said, “the sheep will die if the farmer doesn’t show up soon”, but she was silent, unable to reply. The last time I saw Karen was the day she came into the shop to sign the completed edition of prints. The other printers in the shop were eager to receive their customary copy or “artist proof” from Karen. Not long after I finished her print, I went back to America. When I returned to Holland the following year I was back in the workshop with Piet reflecting on events from the previous year. When I asked about Karen he lowered his eyes and shook his head. “Dead”, he said, then he paused, “hanged” and walked back into the shop. No drama, no explanation, only a personalized note on the bottom of the print from the artist to the printer. Robert Tomolillo began his career during the burgeoning of print workshops in 1970. He worked at Impressions Workshop in Boston and at the Printshop in Amsterdam, Netherlands. Bob earned a B.F.A. from University of Massachusetts and an M.F.A. from Syracuse University. A faculty member at the F.A.W.C. in Provincetown, Mass. and member of the Boston Printmakers since 1983, Bob's lithographs are included in collections both in the US and abroad. In 2009, he was the co-winner of the Dayton Peace Museums International Peace Prize for The Arts. He is currently participating in the London Liberal Arts College "Year of Subversion Exhibition". His essays on art have recently appeared in the Print Alliance Journal, Prints and Politics and Visual Overture Magazine. Other writings have appeared in Literal Minded, Orange Alert, Shine Journal, Creative Writing Now, Blinking Cursor, Bap Q, Lunarosity, Icelandic Review, Writers Billboard, Subterranean Journal, South Jersey Underground, Cavalier Magazine, Yellow Mama, Vox Poetica, Ascent Aspirations Magazine, and Spilling Ink Anthology.